Well, that's what a recent Business Week news report implies. For some of you who have been collecting anime figures for at least the last two years AND you live outside of Japan, you probably noticed even the 1/8th scaled figures have risen in their price scale. Back when I first added the anime store to this site, the going retail for most 1/8th scale figures was between $50-$75. 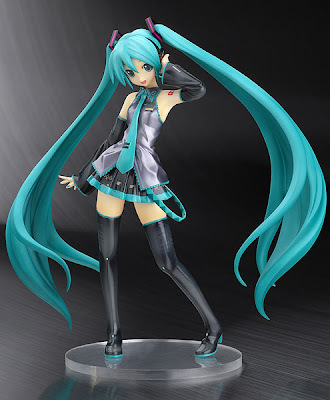 That has changed to around $65-$100+ for basically the same type of anime figures. Why is that? Well, for us here in the US we have this little bank you might have heard called the Federal Reserve. They have the power to print more money if the country (or big companies) owe too much. They have practically unrestricted power and have yet to and probably won't ever be audited (though they so definitely should). Before I start sounding like congressman Ron Paul, the point I'm getting at is that the anime figure (or anything from Japan's) price increase came from the Yen being stronger than the US dollar since the Recession caused the Federal Reserve to suddenly make lots more "fake" bills to pay for our unresponsive gaijin selves. The result: a weaker US dollar and stronger yen and now the anime figures cost more for the store you buy from and you as well. How strong has the yen got? Well, back only 2 years ago every 1 US dollar equaled about 120 Japanese Yen. That same dollar only gets you 88-89 yen. Yeah, not exactly a good return on your investment -_- Imagine ordering 300,000 yen worth of stuff and watch every day your order go from $2500 to $3300. Thankfully, it seems that the Bank of Japan, based on that Business Week report, will finally infuse some yen into the country to make the Yen weaker, as weak as 100yen/1$ (we can hope). Not being able to sell cars (ok minus the sell-propelled ones), anime figures, electronics or other items to people outside Japan not only makes us anime fans sad, but could ruin Japan since the country really relies on exports to keep them afloat. poor credit motor finance option.